Within the bustling stretch of Keong Saik is a new all-day bistro and wine bar - Gaston Burgundy Bistro & Wine Bar, offering comfort French fare and delectable wines from Burgundy. 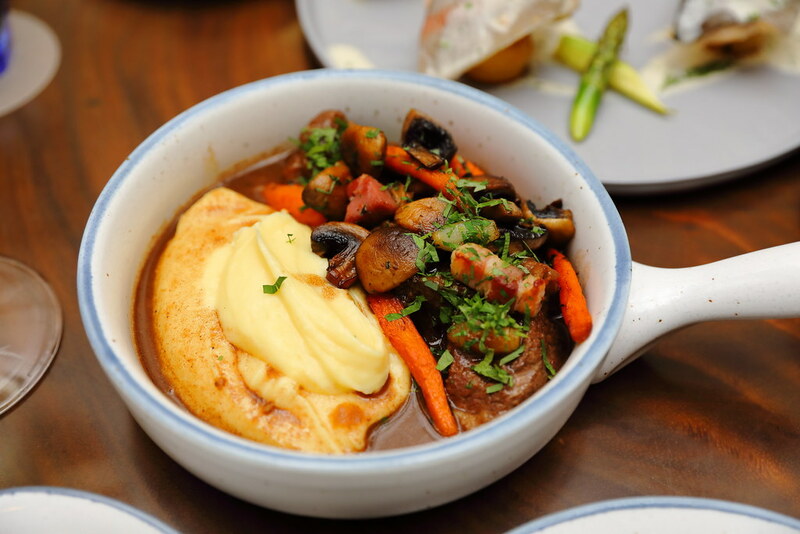 The bistro is helmed by owner and general manager Geoffrey Daurelle from Burgundy, who is inspired to bring the taste and culture of Burgundy to Singapore. He has rooted in Head Chef Julius Soo Thoo, who has worked in the kitchen of L'Atelier de Joel Robuchon and Iggy's to bring the classic Burgundy cuisine to the table. The Croquettes Bourguignonnes ($9 for 3pc / $18 for 6pc) is like our cheese and ham sandwich except it is in a croquette form. It uses Epoisses cheese which is is known as Burgundy's most pungent cheese. I didn't find it that smelly at all. 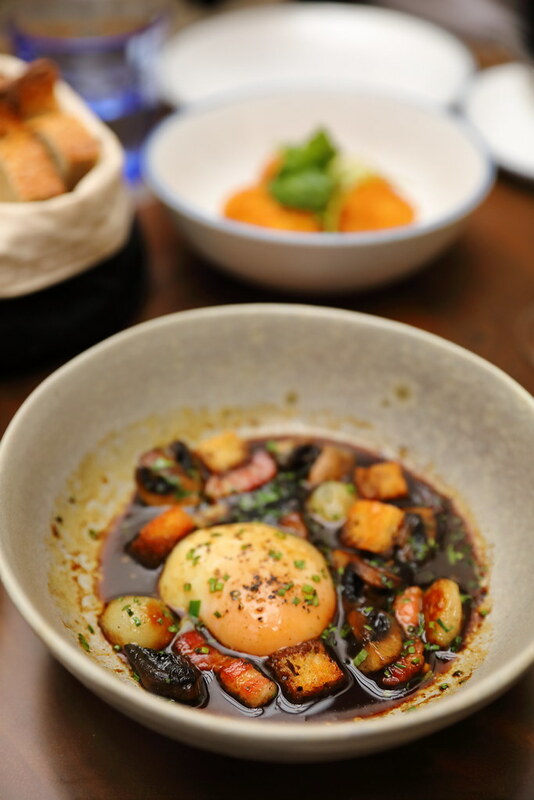 The Oeufs en Meurette ($13/$21) is like our local soft boiled egg breakfast in dark sauce. It comes with a poached egg in red wine sauce paired with onions, bacon and mushrooms. I do recommend saving some bread to mop up the dish just like how we local have our egg and toast for breakfast. 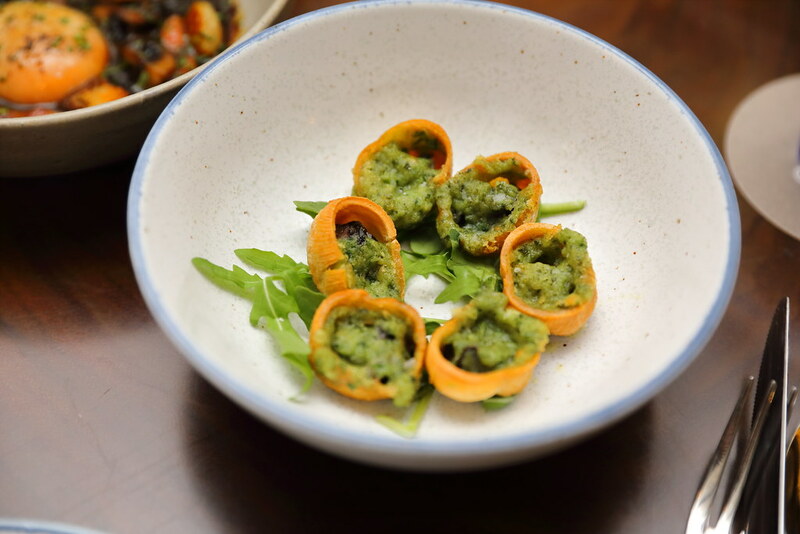 Some diners can be deterred by the sight of the escargot in its shell but the Escargots de Bourgogne ($15 for 6pc / $28 for 12pc) here is de-shelled and served in a pastry shell paired with garlic, butter and parsley. Love the idea as it is really easy to just pick it up and pop it into the mouth. Passed down to Geoffrey Daurelle is his mum's recipe for the Boeuf Bourguignon ($32). The beef stew in red wine sauce is cooked to tender with carrots and mushrooms. Noteworthy is the creamy and smooth mash potato, which consists of 50% potato and 50% butter, similar to what the now defunct L'Atelier de Joel Robuchon Singapore used to serve to their diner. 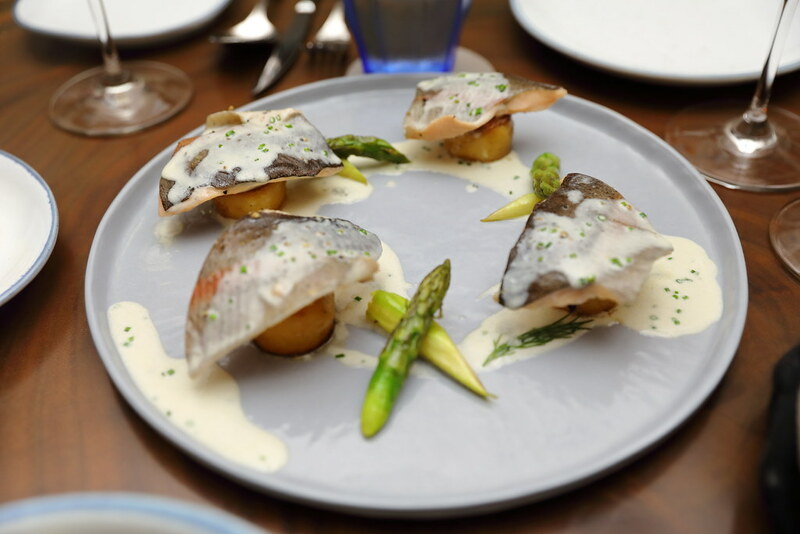 The Truite a l'Aligote ($28) is a match in heaven with the white wine sauce made of Aligote (white grape from Burgundy) complementing the steamed trout fillet. 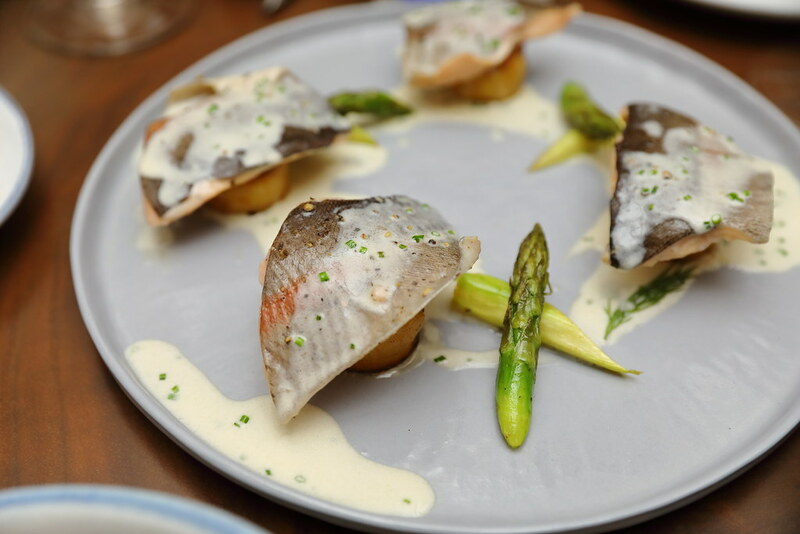 The trout fillet is rested on pommes fondant and pair with asparagus. 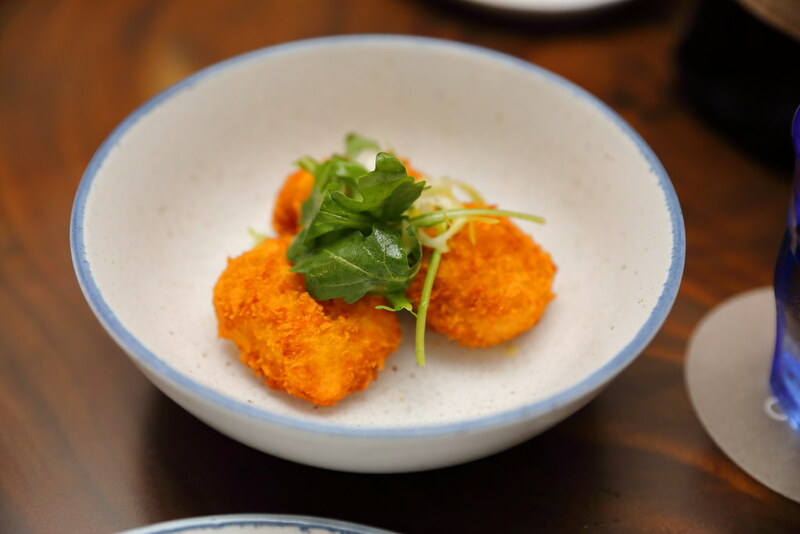 A clean, light and delicate dish. The Flan Patissier ($12) comes in a light pastry crust filled with smooth and eggy vanilla crustard. 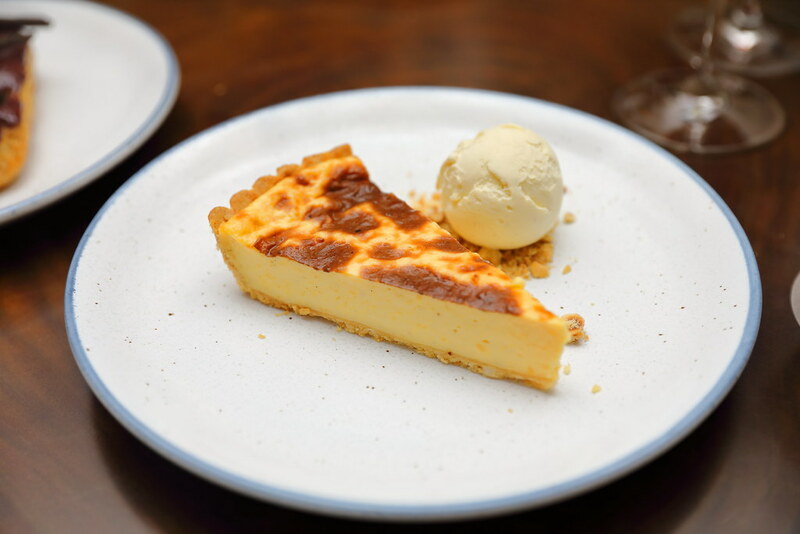 It is served together with a scoop of vanilla artisan gelato. For something richer in taste, there is the Eclair au cassis ($14). The classic French choux dough shell are filled with purple cassis custard cream, instead of the usual chocolate or vanilla cream. 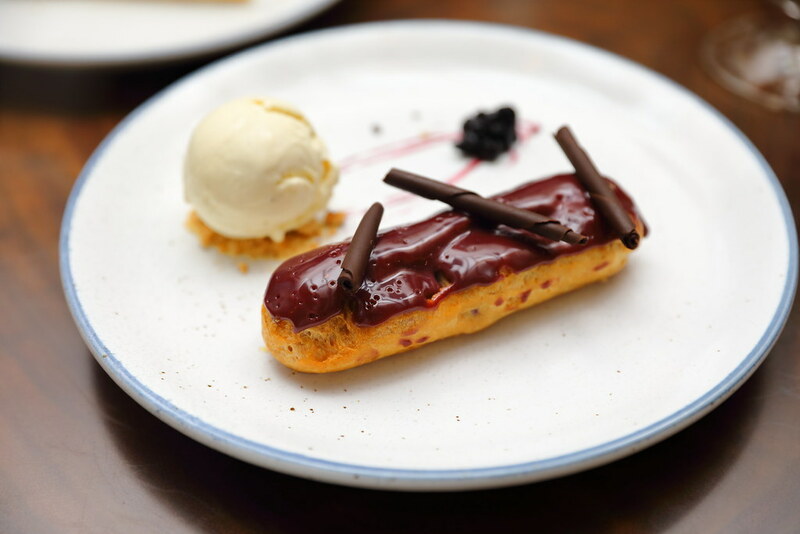 The cassis berry which is an iconic fruit of Burgundy gives the eclair a sourish finish that is very appetising. Contrary to popular belief that wines from Burgundy are expensive, the wine bar offers value for money gems, especially those from lesser-known sub regions in Burgundy such as Côtes Chalonnaise and Mâconnaise, as well as appellations like Macon. There is an extensive selection of quality, great value vinos of close to 350 labels from Burgundy and beyond held within the wine bar’s dedicated walk in cellar. Committed to ensuring that the wine programme is highly accessible, varied and exciting, the wines are sourced directly from the vintners themselves. With an extensive wine-by-the glass programme of close to fifteen wines (including premium Champagnes) as well as a rotating ‘Wine Flight of the Week’, there is something for everyone from novices to seasoned wine drinkers to tantalise the palate.